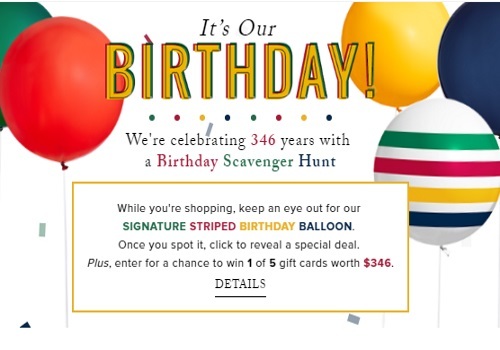 Hudson's Bay is celebrating their 346th birthday today with a Birthday Scavenger Hunt! While you shop around their online store, keep a look out for Signature Striped Birthday Balloons! Once you see them, click to reveal a special deal and enter to win 1 of 5 gift cards worth $346! Offer ends tonight, Monday, May 2 at 11:59pm ET.